Publisher’s note: We asked both Vance Koven and Liane Curtis to review this concert because of their various but complementary interests in the program. Their respective remarks are interleaved below. VK: The extensive collection of period pianos that Michael and Patricia Frederick have assembled and house in Ashburnham has been the inspiration and raw material for a concert series now in its 31st season. Each program highlights one instrument from the collection, ideally one suited by date and provenance to the program at hand (or perhaps it’s the other way around). 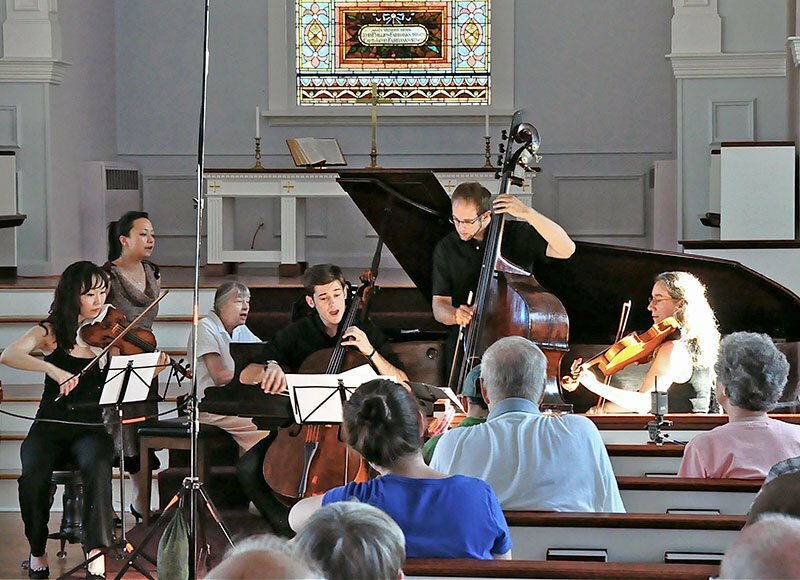 On Saturday the offering was one of a handful of chamber music presentations on this year’s series, the theme of which on this occasion was New England heritage, featuring a set of 18th- and 19th-century hymns, and major works by Beach and Foote. LC: This program was part of a festival with two chamber concerts on consecutive days, both featuring pianist Yi-heng Yang, who curated the works to be played. VK: The instrument used, however appropriate from a period standpoint, was not what one would expect. An 1877 Blüthner from a historic Leipzig maker (still in business) rather than a Mason & Hamlin or Chickering from Boston was onstage because, I was informed, that the instruments in the Frederick collection that would have been the right pairings were alas, either not in suitable condition or available for this concert because of administrative limitations. According to BMInt’s Christopher Greenleaf, who serves as the series’s recording engineer, the Blüthner did have a features in common (at least in name) with the better American pianos of the period: a set of “extra” strings called the “aliquot”, which aren’t struck by the hammers but vibrate sympathetically. [The American piano manufactures used the term aliquot for tuned sections of the regular strings between the bridge and the hitchpins—something quite different.] The device as Blüthner applied it added independently damped half-length strings stretched above the upper two thirds of the instrument’s compass in order to reinforce the sustain in the treble regions and develop an ethereal aura around the primary sound. Unfortunately, the specimen used for this concert has had its aliquot strings removed—replacing them along with the associated hardware will be part of its eventual restoration. LC: Fortunately, this specimen had those strings removed, because the last thing we needed in the very resonant acoustic of the otherwise austere Ashburnham church was more layers of sound around the primary sound. I would imagine that European pianos such as Blüthner were occasionally found in New England, though Amy Beach was linked particularly with Morris Steinert of Boston and New Haven. In the 1890s Beach had her American Steinway fitted with the special Steinertone action, and supported Steinert enthusiastically until he stopped producing the Steinertone sometime after 1906. (according to the biography Amy Beach: Passionate Victorian, by Adrienne Fried Block, 1997, Oxford Univ. Press, p. 174). I am not at all a connoisseur of historic pianos, but I did enjoy the dark, merlot qualities of this instrument’s lustrous timbre. VK: Still, the music and the setting in the country church that is the festival’s performing venue were appropriately flavorful. The hymn set opened, with arrangements by Steuart Pincombe, who was also to have been the cellist for the concert. But since he and his wife, Michelle, who was to have sung in this set, were indisposed, cellist Jonathan Butler, doughty soprano Patricia Frederick and all the other performers raised let their voices sing). The ensemble of violin (Tricia Park), viola (Sarah Darling), cello (Butler), double bass (Maxwell Zeugner, of the New York Philharmonic) and piano (Yang) offered the well-known “What Wondrous Love Is This,” William Billings and Perez Morton’s “When Jesus Wept,” Robert Lowry’s “How Can I Keep from Singing,” and John Leland and T. W. Carter’s “Ecstasy.” In crediting himself only as “arranger,” Pincombe may have been overly modest, since several of these, especially “Wondrous Love” and “When Jesus Wept,” could be better characterized as settings, with substantial creative thought going into the musical presentation. The former opens sparely with just the violin intoning its hauntingly modal tune, adding voice and then the rest of the ensemble, creating a feeling of variations through the stanzas. The latter is, of course, one of Billings’s classic “fuguing tunes,” whose rough-and-ready counterpoint Pincombe enhanced. The Lowry was given a delightfully jazzy interpretation, while “Ecstasy” was full of its own rhythmic pep. The one curious feature here was the instrumentation, whose sound was (according to Greenleaf) deliberately bottom-heavy (a feature only enhanced by the remarkable resonance of Butler and Zeugner’s playing, on 19th-century instruments). This seemed strange, since the darkness of the timbres conflicted with the generally upbeat message of the hymn texts. LC: I too enjoyed the hymns, and particularly the Lowry “How can I keep from singing”—it was refreshing to have such a well-known song recast—recomposed, even—in a new rhythm, a 4/4 meter, as opposed to the traditional ¾, and with quite a spicy syncopation. Patricia Frederick was a perfectly adept singer with a warm voice, and I am always moved when instrumentalists sing—after all they are such musical people, and the effect is always heartfelt and compelling. And I was especially impressed to see them playing and singing at the same time! VK: Amy Beach, née Amy Marcy Cheney, and known during most of her lifetime (1867-1944) as “Mrs. H.H.A. Beach,” was one of the most extraordinary products of 19th-century New England culture. A child prodigy at the keyboard, given her druthers she would have remained a piano virtuoso; but if she had, who would know of her today? Married at 18 to eminent Boston surgeon Dr. Henry Harris Aubrey Beach, who was uncomfortable with her globe-trotting, she turned to composition with her husband’s encouragement (she took up touring again after his death 25 years later, but by then she had both a major reputation and a long catalogue of her own works to play). Except for one year of harmony and counterpoint as a teenager, she was entirely self-taught as a composer, and her omnivorous study yielded a musical voice of uncommon originality, probably the most harmonically daring of her contemporaries. Her Violin Sonata in A Minor, Op. 34, dates from 1896, and is actually much less forward harmonically and technically, and a bit more generic in affect, than other pieces of hers from the period (the writing is all bowed legato, and uses hardly any double-stops). Despite its sometimes magpie blend of other composers (Brahms was noticeable in the slow movement, and Grieg sounded out in the finale), it is a fine example of the Romantic sonata with a particularly American emphasis on melody (a trait Americans used to share with Russians), and a rugged, solid structure with a strong developmental sense. Park and Yang were clearly interested in giving it a full-throated Romantic reading, both in its declamatory and lyrical moments. Park’s tone was excellent and her vibrato well controlled; at the high end of the register, especially in fast passagework, the intonation could slide a bit, but generally her playing was well focused. Yang produced well-voiced and shaded lines, especially in the slow movement, but we must note that the un-restored piano sounded rather dull (well, if your hammers were 140 years old, you wouldn’t make the most sparkly sounds either). LC: The inclusion of Beach’s Sonata on this program drew me to it. I’ve been doing some work on the Amy Beach website, and am hoping to cook up some plans for the Beach Sesquicentennial in 2017. So I’ve been quite steeped in Beach and was happy to celebrate her 148th birthday (Sept. 5) by hearing one of my favorites of her many remarkable works, one whose rich melodic unfolding seems to have imprinted itself on my consciousness. I’m in agreement with Vance’s assessment of the harmonic language, but I bristle at the description of Beach’s “sometime magpie blend of other composers”—Beach of course was influenced by Brahms, as many other composers were, and in turn Brahms was influenced by composers who preceded him. I suspect the insistence on linking Beach with her predecessors is a habit of trying to contextualize her, because we lack the familiarity with her works that we have with someone like Brahms. After all I remember playing Brahms’s music in junior high—I didn’t hear a note of Beach’s music until several decades after that. I’d only had the opportunity to hear the Sonata live one time before, in 2000, performed by Irina Muresanu; that there are now a number of wonderful recordings is testament to Beach’s gradually growing recognition in recent decades. Another indication of this is the inclusion of the second movement of the Sonata in the Score Anthology to Music in the Nineteenth Century, ed. Walter Frisch (2012, W.W. Norton), where she and Gottschalk are the only Americans. 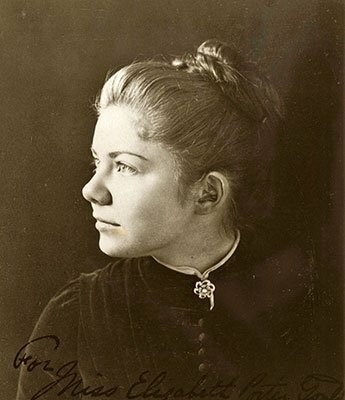 When Beach wrote the Sonata she had recently completed her monumental “Gaelic” Symphony, and brought this experience in sculpting a large-scale form to this Sonata. Vance is correct that the bowing is mostly legato, as it is a melodic unfolding of ideas, but I also heard some brilliant chords in the violin (end of first section of second movement; beginning and end of fourth movement), plus the long melodic statement in double-stopped thirds in the Largo con dolore third movement. Beach imbues her melodic writing with emotional weight by having the violin climb from its lowest range to its highest register in just seven or eight measures—a trait that she employs many times. This expansiveness in the breadth of the writing is one element that fills the work with intensity. It also fills it with perils for the performer, and Park navigated it with a flawless assurance. Park and Yang played with a sense of drive and momentum that gave the work a sense of malleability, of breathless intensity; this in turn gave shape and cohesion to the larger structure. The two long, gradual crescendos of the Largo con dolore are examples—they were not just crescendos but expansions, increases in tension achieved through the building of articulation and tempo as well as volume. The first one grows (and grows) until it just touches a rolling boil, before turning back to soak in a dark interlude (those brooding double-stops). Then it starts to build again, but this time more cautiously, as if we’re sadder but wiser now, even a little wistful; so nuanced was the dolore of the players in their understanding of Beach’s writing. I own four recordings of this Sonata, and this performance certainly ranks with the best of them (including the Silverstein/Kalish). 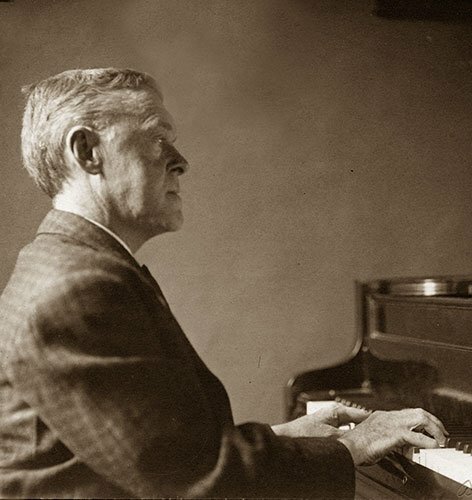 VK: The closing scheduled work was another masterpiece by a member of the “Boston Six” (the official roster, in birth order, was Paine, Foote, Chadwick, MacDowell, Parker and Beach), Arthur Foote’s Piano Quartet in C Major, Op. 23 (1890), a work as bright and cheery as Beach’s is intense. Foote could manage to be delicate even when producing music that was loud and fast, and, with Chadwick, had a true gift for writing scherzos (whereas Chadwick’s were folksy and chuckly, Foote’s were gossamer like Mendelssohn’s). The highly-polished Quartet includes some wonderful tunes and subtle harmonizations, and a rhythmic invention he displayed only occasionally: the outer section of the scherzo, for example, has five-measure phrases, and there are numerous cross-rhythms throughout the quartet. It’s no denigration of the younger composer to note that the fugal writing by 37-year-old Foote (it seemed obligatory in those days to have fugato passages in sonata movements, usually in finales) was more assured than 28-year-old Beach’s, and that his instrumental technique was wider-ranging—each section of the scherzo ended with a delicate pizzicato; and there were other surprises, such as a finale in C minor, allowing him to come roaring in with a great big tune in major, on which the movement gallops to a close. The performers got very much into the spirit of things, seeming to enjoy themselves through all its felicities, and bringing a rich and intense sonority to the central section of the slow movement. Re Beach’s fugal passage, I don’t find it lacks anything; it’s a fugato that begins the development section of the final movement, using short phrases (drawn of course from earlier thematic ideas) and staccato accompaniment. It’s a complete change of texture—one that is lighter, despite the polyphony. It doesn’t grow to a full-fledged fugue, but that was clearly not her intent here. LC: In my first time in this venue, I enjoyed its historic atmosphere, but a set of curtains over the large windows, on at least the west side, would have the advantage of dampening the acoustics a bit, as well as protecting the audience from the unmerciful march of the sunlight across the hall, creeping right up to the musicians, striking violist Sarah Darling. I speak as one who has gone in search of discounted curtains, and hung them myself in a concert venue (using an eight-foot ladder, and then using it again to take them down). This church would be a bigger job than what I did, but I just mention this because sometimes it is worthwhile to take matters into your own hands …. But on the whole it was a wonderful afternoon, with the added pleasure of seeing some lovely rural life and countryside, where the leaves are just taking on some first hints of brilliant color. Thank you for this excellent collaborative review. Collegial corroboration and alternating points of view work well under one roof, as here. Patricia and Michael Fredericks’ Music from the Frederick Collection, the Historical Piano Concerts in Ashburnham, reflect the repertoire and concepts that thinking performers bring them. So it is the intellectual richness of pianist and irrepressible cultural instigator Yi-heng Yang that fueled this first chamber festival there. Her quiet pursuit of “why ever not!” musical possibilities, abetted by a discerning ear for worthwhile, complementary repertoire, met with firm, equally quiet support from the Fredericks. And so these two concerts came to be. Vance Koven’s and Lian Curtis’s review is in the finest tradition of that (often avocational) profession. I cannot help but add that the most memorable take-home from our chamber afternoon in Ashburnham was the great heart and love of their music flowing from all the performers. I note especially the deeply touching playing of co-curator Patricia Frederick in the bookend revival songs and hymns. Pat does all the administrative, PR, and AR work of the Collection. Her steadfast efforts assure that advance series funding is in place, good programming choices get made, and artists return as regularly and gladly as bees do to lavender. It’s easy to forget that she’s also an active, much-appreciated church musician and an effective music teacher. Finally, to the 1877 Blüthner concert grand. Yes, it now sadly lacks its aliquot strings, the sympathetic, unstruck strings responsible for a part of the great esteem in which chamber musicians and Lieder singers have long held the firm. Through Ms. Yang’s understanding playing, the instrument’s velvet richness and darkly vibrant tone arguably suited its role in partnering all four modern string instruments in the rare, thought-provoking repertoire described in the review. This is more veiled sonic territory than we’re used today. Once one becomes accustomed to stupendous helpings of dark, dark chocolate, its magic unfolds and irresistibly draws one in. The review did not mention the seemingly endless sustain of the full range of piano sound and its clarion, singing high treble. Both characteristics brought something to the Beach that, I sense, wouldn’t have been unfamiliar to the composer, but are unlikely to emerge from today’s blander, less polychrome grands. The Blüthner’s tonal production felt like a home æsthetic for the Foote, too, though the lighter texture of his charming C-major piano quartet would also have suited the brilliance of early-modern Steinways and Chickerings, straight-strung or overstrung. A lovely and thoughtful review! I have a few comments/corrections, however. 3) the instrumentation for the hymns I wouldn’t call “bass heavy” at all. Four instruments, one for each of the vocal parts (soprano, alto, tenor and bass) and true to New England church tradition of having a bass viol. Some of New England’s finest cabinet makers actually went on to become wonderful instrument makers specifically due to the demand for “church basses”- smallish bass viols for use in church services.